Avon Precious Moments, Pin/Pendant, May your happiness. 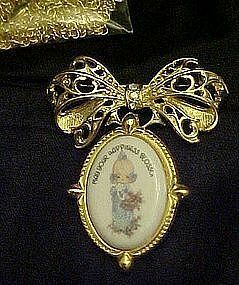 This is a 1999 Avon "Pecious Moments Pin pendant and/ or Necklace. The pendant says "May Your Happiness Blossom". The Pin can be worn seperate or on the 29" chain Necklace included. The Pin/Necklace is New in the box and has never been used. The pin/Necklace includes only one box, the picture shows two in order to show you the buyer both the front & inside of the box.